It’s apple season! What’s your favorite variety of apple? One of my favorite varieties are Honeycrisp apples. Their “season” is very short and unfortunately they are more expensive than some other apples, but they are so good! They are worth the splurge to me! Leave the peel on. Peel = nutrients! Traditional recipes for apple butter call for the apples to be peeled. Don't do it! The peel is loaded with nutrients. The apples are blended at the end of the long cooking time and the peel just melts into the apples. Traditional apple butter recipes are high in added sugar (and store-bought apple butter is very high in sugar!) but this recipe just uses 1/4 cup of brown sugar. I used a combination of tart Granny Smith apples and sweet, red Gala apples. And the ch-ch-ch-chia?? (Remember the commercial?) Don't worry, you're not growing a plant here. Chia seeds are loaded with omega 3 fatty acids, fiber, and antioxidants. These seeds absorb the liquid from the apples, forming a gel. 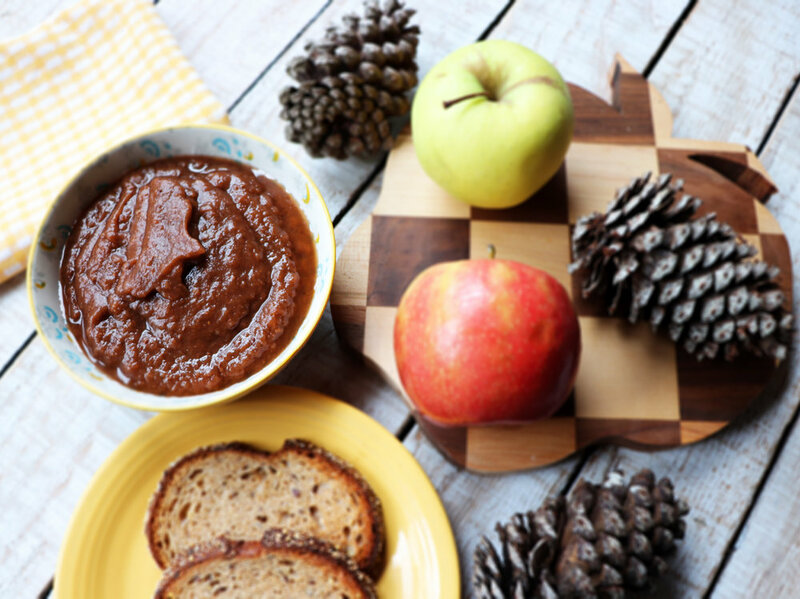 This keeps the apple butter thick and boosts the antioxidant profile too! See the little chia seeds? Other than coring and chopping a lot of apples, all you do is mix the apples, chia seeds and spices in a slow cooker, cover and cook on low and you're done! Cooking it low and slow produces that beautiful, rich, deep brown color. A bonus of this recipe is that your house will smell amazing during the cooking process! Leave it chunky or use an immersion blender to get a smoother consistency. Combine all ingredients except the vanilla in a slow cooker. Cover and cook on low for 10 hours. Turn off the heat and stir in the vanilla. Leave chunky or use an immersion blender to blend to desired consistency. (Or use a regular blender). Let cool and store covered in the refrigerator for up to 2 weeks.